After visiting Thanthondreeswara Temple, my next stop was Mathangeeswara temple. This is also called Matangeshwar temple and Mathangesvara temple. When my friend lead me to the temple on the CSI Church Hospital Road, I was thinking the temple might be somewhere at the end of the road or in some left or right turn. Suddenly my friend stopped and turned around. I wondered why and there in the middle of 2 little shops on the busy road, was a gate with ASI board on it. Beyond that gate was this tiny, hidden, but absolutely mind blowing little temple!!! Btw, the road is the very reason, why amusingly this temple is called 'Church Koil' by some locals!!!!!! 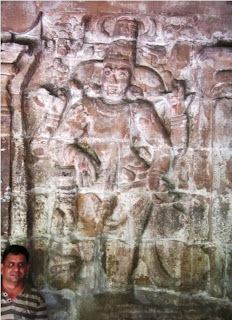 The size was almost same like Jvarahareshwara Temple. This too was built by Pallavas. 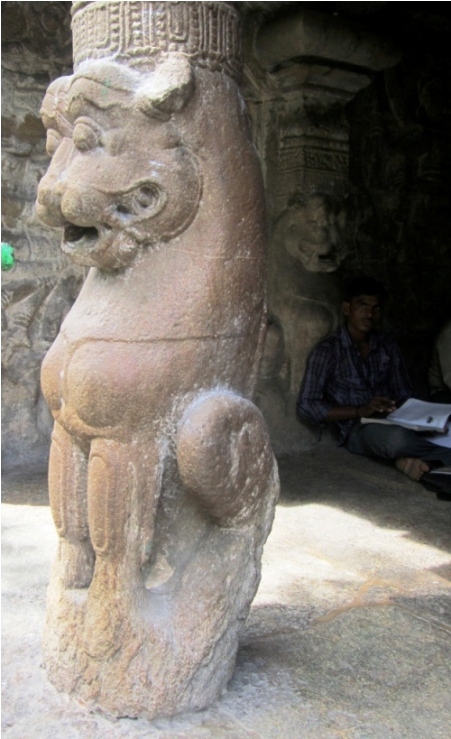 The typical simha thoon can be seen here. 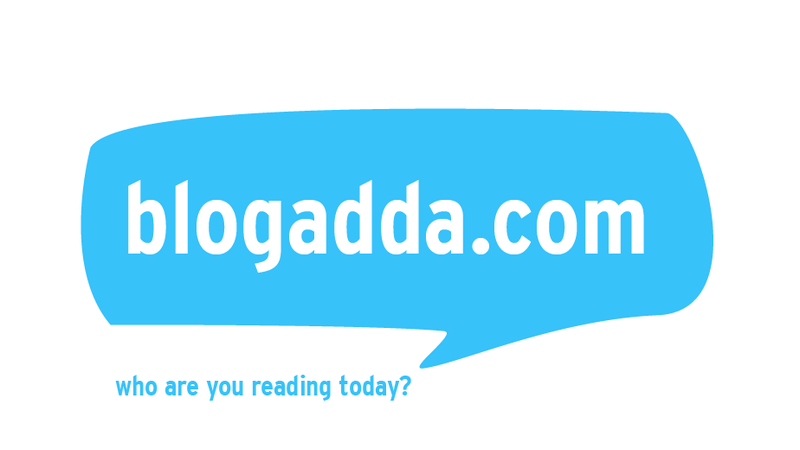 On the upper portion of the Simha Thoon are some inscriptions in Grantha script. The temple is on an elevated platform. This temple too was closed when I reached there, so I have no clue of how the sanctum sanctorum looks like. The first panel on the left wall is Gaja Samhara Murthy. The facial features are gone. A scared Uma is seen on the left. The elephants face is seen on the right. Lord Shiva has 6 hands. 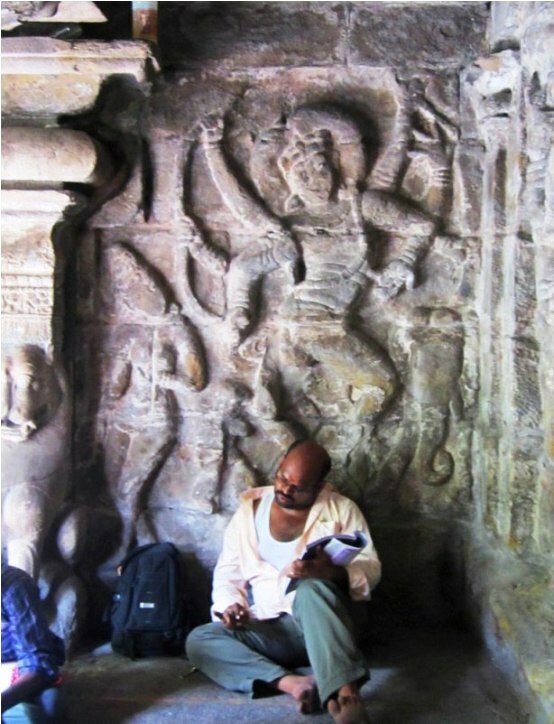 The second panel on the left is Ravana Anugraha Murthy. Almost 2/3rd the height is covered by Ravana in the composition. 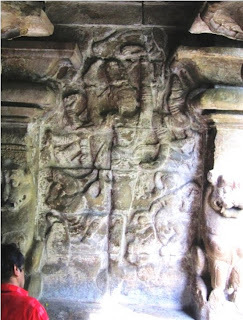 5 faces of Ravana are visible and almost 15-16 hands are visible.He is kneeling down and shaking the Himalayas and we see his back. 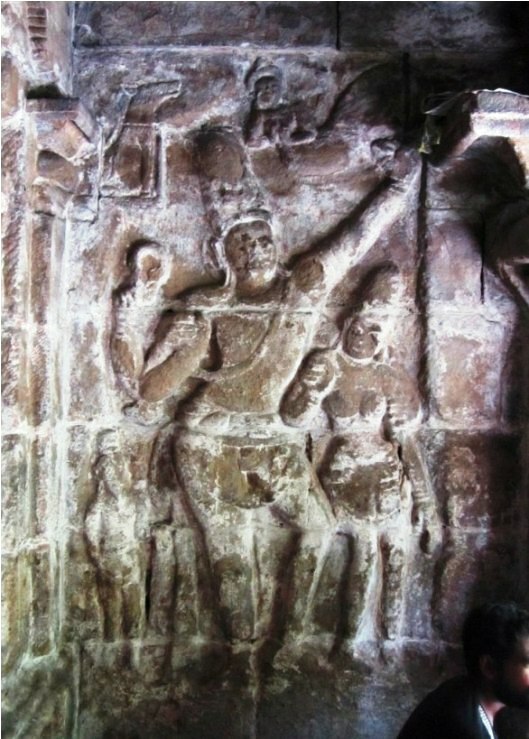 3 bootha ganas are seen and Shiva and Parvathi are atop. On either sides of them are flying celestials. 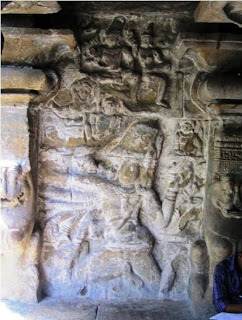 The first panel on the right wall is of Ganga descending on Shiva with Parvathi beside. 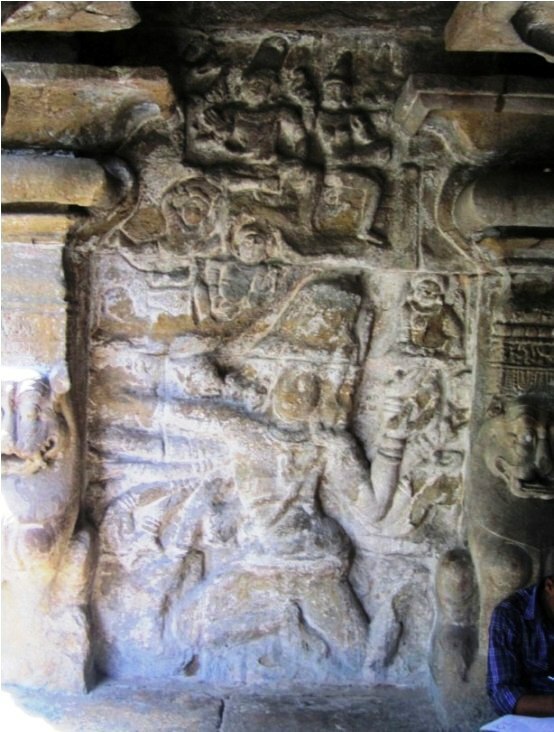 A sage with beard and top knot, possibly Bagiratha / Arjuna is seen to the left. 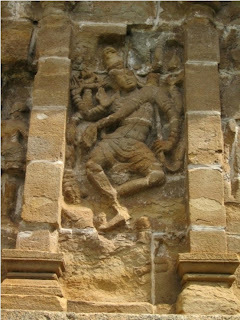 Shiva has 4 hands and is holding Parvathi with one. 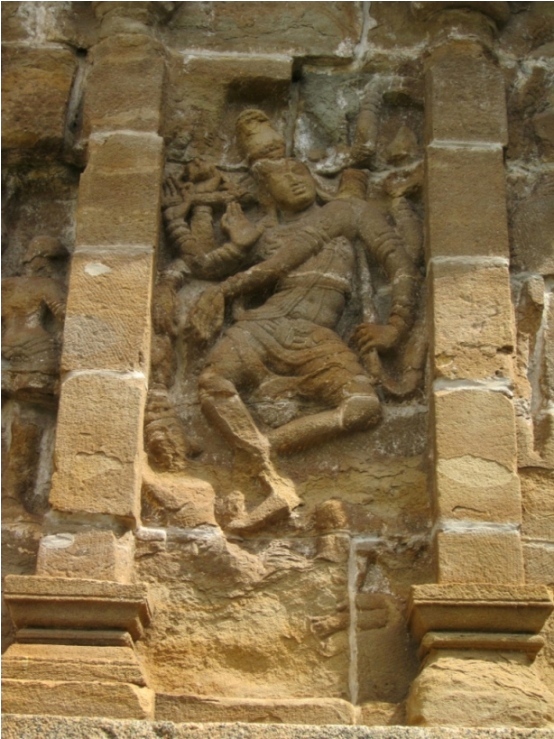 He's holding a strand of his hair with another hand and Ganga is coming down from the top right corner. She has her hands in praying pose, and her lower body is just stream like. A dog is seen on the top left corner. Remember the Lalithankura Cave temple at Trichy? A dog was seen there too. I dunno the specifics of the dog in this scene! 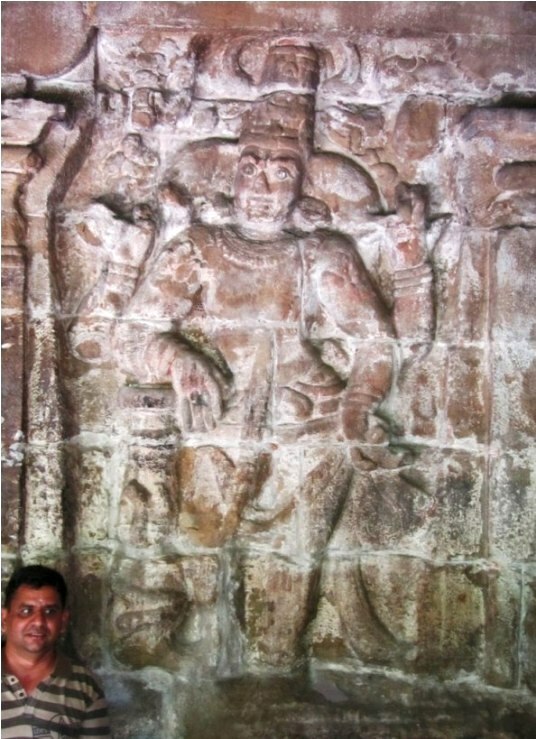 The second panel on the right wall is of Siva in Urdhva Thandavam. He had one foot on ground and one foot towards sky with a hand around that leg. He has 10 hands. A person (possibly, Parvathy) is seen seated on the left looking tired, vexed with one hand on the head and another hand supporting this at elbow! 2 musicians are seen on the right. And ofcourse there's Muyalagan beneath. The outer wall is completely filled with panels of individual Gods and Goddesses with 2 people on either sides with Simha thoon at regular intervals. The temple serves as a peaceful abode for students and people preparing for promotion exams. I saw people of quite a vast age group studying in here!!! To reach Kanchipuram: Refer to my earlier post. The place is wrongly marked as Marundeeswarar Temple in Google Maps! Nice post of a little known temple. Wonderful to know about this temple . Pallava architecture at its best . Beautiful and informative as always. Wonderful! I never knew about this Pallava temple. I missed it during my visit. Thank you PNS Sir. It is a lesser known temple. Even many the locals don't know its existence! Cool trip ! What means ASI on the board ? 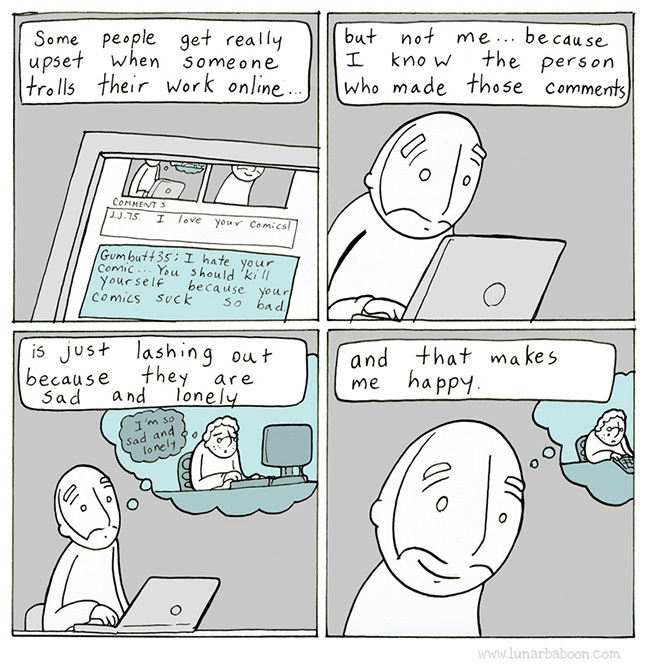 Thank you for the wonderful find. I was there today, and one could easily miss this monument among the shops. I also noticed that several youngsters were studying in the compound as it was an oasis of peace in the bazaar.